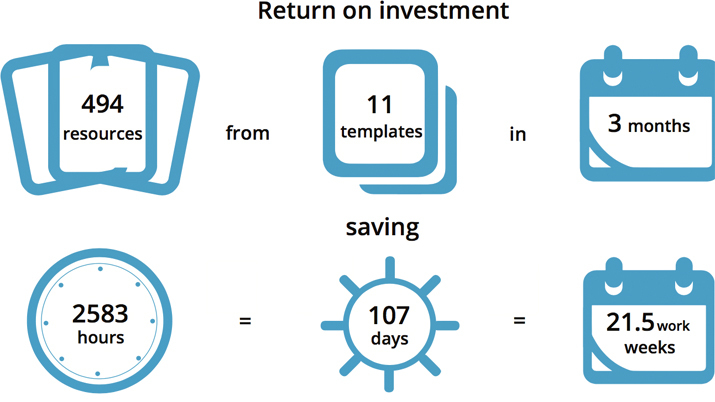 How this UK charity saved 107 days work by improving their digital asset strategy. Leonard Cheshire exists to improve the life choices of people with disability. They support thousands of people living with disabilities through a wide range of care and support services across the UK.Leonard Cheshire operate over 200 care homes, have over 7,000 members of staff and 3,000 active volunteers. Leonard Cheshire have staff across multiple locations that need to produce marketing material. Many staff lacked the skills required to make their own material using design software, meaning artwork was produced that did not meet the brand requirements. This made it difficult for them to maintain a consistent brand identity across the organisation. The organisation had already invested in Asset Bank’s Digital Asset Management Platform to manage their digital assets, as it enabled them to ensure that images that were available for use always had the correct consents, something which was important as they had many images of service users. Having been a customer for over 10 years, Leonard Cheshire use Asset Bank to download, share and archive all of their digital media collateral. As a charity representing people with disabilities it was hugely important that the process of creating material was exceptionally easy to use and could be adapted to meet their own accessibility requirements. Leonard Cheshire were launching a brand refresh and wanted staff to feel enthused and inspired to make new material using the new brand. To facilitate this they began searching for a templating system for producing on-brand communication material using curated images from their Asset Bank DAM. Leonard Cheshire selected BrandStencil as it is an extremely easy to use system with a seamless integration with Asset Bank, requiring no additional login or navigating between separate systems. Staff at Leonard Cheshire can now take advantage of a streamlined process for selecting images from their Asset Bank platform from within each BrandStencil template, enabling them to create effective communication material with quality imagery, all with the appropriate consents. Leonard Cheshire are able to curate the images they want available for each template, helping them ensure images used in artwork meet the new brand requirements. User permissions set within Asset Bank ensure that each individual can only access images they are allowed to use, giving Leonard Cheshire peace of mind that images are always being used correctly. Asset Bank and BrandStencil have worked closely together using their combined expertise and the extensive Asset Bank API to deliver the exact functionality Leonard Cheshire need from the integration, and there are plans to evolve it further to allow users to search within folders. Having access to their library of images right at the point of need has been a powerful benefit to integrating the platforms, meaning Leonard Cheshire can take advantage of the ‘best of breed’ features within each, maximising the usage and return on investment of both. Asset Bank is a Digital Asset Management solution created by UK software development consultancy Bright Interactive. Launched in 2005, Asset Bank continues to lead in the DAM sector by offering an outstanding service at a competitive price. Asset Bank helps companies organise, share and control their digital assets. The platform is currently used by over 700 organisations, including Unilever, ITV and Deloitte, and is acclaimed by users for its award-winning ease-of-use coupled with excellent customer support. BrandStencil is a template platform where everyone connected with your organisation can instantly create on brand, customised artwork that is ready for print straight from the browser. BrandStencil protects the investment you've made in your brand and saves you time and money every day. BrandStencil was launched in 2014 by Electric Putty. Since launch over 48,000 resources have been created by over 6000 users using 354 templates. If you’re already using Asset Bank and you want to integrate it with BrandStencil, or if you want to find out more about what BrandStencil can do, please visit their website brandstencil.com or get in touch on info@brandstencil.com or 01273 434676. Leonard Cheshire exists to improve the life choices of people with disability. They support thousands of people living with disabilities through a wide range of care and support services across the UK. Leonard Cheshire operates over 200 carehomes, have over 7,000 members of staff and3,000 active volunteers. Contact Charlene D’Acres, Brand and Marketing Manager at Leonard Cheshire on charlene.d’acres@leonardcheshire.org or 020 3242 0377. "Our partnership with Asset Bank has been very successful; we’ve been able to create deep integrations between our software platforms through our close collaboration. Our customers get the benefit of a seamless experience using the best tools for the job, meaning they can instantly make beautiful, rich on-brand materials using their Asset Bank images with smart BrandStencil templates." "Working with the Brand Stencil team has been a pleasure. They’ve provided us with a superb product underpinned by excellent service. It’s been great to tap into their knowledge, skills, patience and ability to think around problems and come up with practical solutions." "We are always looking out for partnership opportunities with like-minded vendors who provide tools that complement Asset Bank, so we can provide as much value as possible to our clients across the entire digital asset life cycle. We know that many of our clients would benefit from the time savings and brand protection provided by a brand templating solution integrated seamlessly with Asset Bank, and we are delighted to be partnering with BrandStencil for this."